Jeremy had a very comfortable pair of shoes that he bought from a well-known high street chain. He was very happy with them and wore them to work every day until they almost fell apart. When the rain water began to seep through to his socks, he went online to see if he could replace them. When he got onto the shop’s website, he was pleased to see that they still stocked a style of shoe that was very similar to his favourites. He checked the size of his old shoes, size 43, and then ordered the same size again from the website, paying by debit card. Four days later the shoes arrived by courier. Jeremy saw that they were slightly different in style to his original shoes, but he liked them anyway. When he tried them on they felt tight, but he thought that was normal for new shoes and remembered that the old pair had felt tight too. The next morning he got up for work and put on a thin pair of socks and his new shoes. By 11am his feet were feeling swollen and sore but he had a very busy day and didn’t have time to do anything about it. Later on that day, he could feel that the backs of his heels were becoming very sore and blisters were forming. In order to alleviate the pain, he bent down the back of the shoes so that his heels were exposed and out of the confines of the shoes. Jeremy was looking forward to going home when his boss invited him out for celebratory drinks as their team had won a new business contract. By the time he got home, Jeremy had been wearing his new shoes for 14 hours. His feet were very sore, swollen and had several blisters on the top of the toes and on the back of his heels. The following morning he telephoned the shoe shop to tell them that he wanted to send the shoes back to the shop and that he wanted a replacement pair that were a size and a half bigger. The lady on the telephone gave him a freepost address and told him to take the shoes to a post office, and to get proof of postage. Jeremy followed her instructions. The shoes were scuffed, dirty and bent out of shape but Jeremy put them back in the box and sent them again. A week later he received a pair of shoes in the post. When he opened the box he found the shop had sent him the same shoes rather than the replacement he had asked for. In with the box was a letter from the shop, which said that they could not replace the shoes as they were not in a condition that would enable them to be resold. As a result they could not accept the request for a replacement. Jeremy telephoned the shoe shop and explained that he thought the distance selling regulations (now the Consumer Contract Regulations) allowed him to return the goods for a no quibble guarantee. 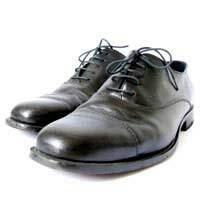 The shop refuted this and said that the Office of Fair Trading (OFT) had issued guidelines to the effect that the shoes had to be in a saleable condition when they were returned. In practical terms this meant that a consumer was entitled to try the shoes on indoors to see if they fitted. If they did not, they should be returned in that same condition. Although the shoe shop was very apologetic, Jeremy did not get a replacement or a refund. Instead, and as a gesture of goodwill, the shop gave him 50% off his next full-price purchase at the shop. Jeremy hasn’t used the voucher. I ordered a pair of trainers from what appeared to be a uk-based online shop. Their website stated free shipping on all orders, but a £10 shipping fee was added at the checkout. I paid this, but pointed out the contradiction and asked for the fee to be refunded. About 10 days later I received a package from China, containing trainers of a different brand, style and size from those ordered. Upon checking my bank account I found that nearly £15 had been taken above the price of the trainers. I have contacted the seller several times via their website and by email, noting these issues and asking to cancel the order and arrange a refund. They have replied several times without addressing the issues and have just emailed again, asking why I want a refund. This all seems suspicious and I am losing patience, having repeated myself several times. My bank have advised that I may be able to claim the money back, but at this point it appears I do not have enough evidence to prove this is a scam.